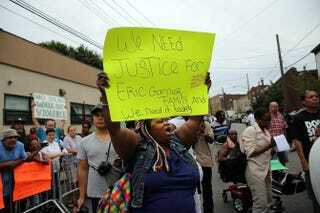 Protesters demonstrate on July 19, 2014, against the death of Eric Garner during an attempted arrest in the Staten Island borough of New York City. Pretty much anybody can make edits to Wikipedia pages. As it turns out, Internet Protocol addresses from the New York City Police Department have been linked to changes in Wikipedia pages about several controversial police-brutality cases, Capital New York reports. According to the report, IP addresses in the computer network at the NYPD’s 1 Police Plaza headquarters have been linked to edits and changes (even attempted deletions) to pages surrounding cases such as Eric Garner, Sean Bell and Amadou Diallo, all of whom lost their lives in officer-involved incidents. An NYPD spokesperson, Detective Cheryl Cripsin, told Capital that “the matter is under internal review.” The news site has identified at least 85 NYPD IP addresses that have edited Wikipedia pages, but it is uncertain as to how many people are involved. The IP addresses have also been used to edit posts on stop and frisk and other controversial topics. Read the full report at Capital New York.